Are you trying to contact Get Satisfaction? If so, I'm all ears. If not, maybe I can point you to the right people. I JUST SET UP MY SITE. WHEN I TYPE IT IN, I AM DIRECTED BACK TO SYNTHASITE. I HOW WILL ANYONE FIND ME THIS WAY? PLEASE HELP! Hey, Lee. It sounds like you need help from SynthaSite. Good news: They use Get Satisfaction, and they're super helpful. I'm going to move this topic to the SynthaSite section, and I can almost guarantee that they'll be jumping in to help direct you to the right places. Eric, thanks so much for redirecting Lee to the right place to get help! Lee: thank you for persevering in getting help with your problem. I am sure we can figure this one out! Can you tell me what the URL (web address) of your site is so that I can check it out? 1) Make sure you are typing the URL correctly. If you accidentally misstype it you will get the SynthaSite homepage. 2) Have you published your site to a domain you bought elsewhere. If so you might be missing a step in the process. Let us know if this is the case and we will tell you what you need to do. I am going to go to bed now as it is extremely late in my part of the world. But when I get up I will look for your response and do my best to help you make sure that your site is up and running. Thanks for getting back to me. The apostrophe in your domain name is what is causing the problem. Domain names can only contain letters or numbers. No other characters and no spaces. So if your site is published then you would have used a different domain name. The reason is that our system would have stopped you with a message saying that your domain name was invalid if you entered an apostrophe. 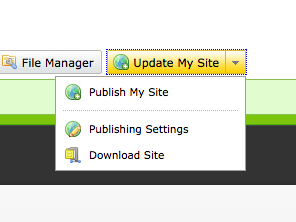 2) click on the arrow next to the "Update my Site" button. 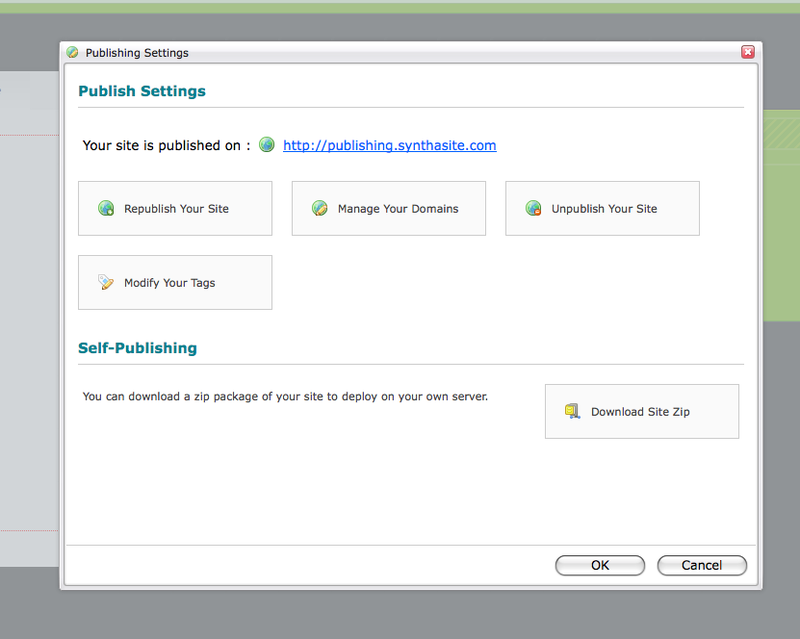 3) Click on "Publishing Settings"
A dialog box will open up and you will be able to check what domain you published your site to. You can see that the site in that picture is published to "http://publishing.synthasite.com" You need to check what yours is published to. Let me know what you see and I will help you from there.